Check ‘n Go positions itself as a direct payday loan lender. 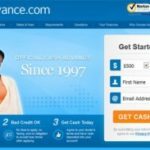 Apart from online and store payday loans, customers can count on getting cash advances, prepaid cards, installment loans as well as check cashing. Let us have a look at the rates and terms of Check ‘n Go’s payday loans. How Does Check ‘n Go Work? Check ‘n Go is headquartered in Cincinnati, Ohio, it has an A+ rating with the BBB. If you run out of cash and want to apply for payday loan, you can do it either online or visit one of Check ‘n Go’s stores in person. To qualify for a loan in either case you are required to fill out an application form and provide a certain form of documentation. It takes about 24 hours to process your application if you apply online and your cash usually transferred within one business day. Saturday and Sunday are not included. Thus, applying for a loan on Saturday,your funds are to arrive on Tuesday at the earliest. How high Are Check ‘n Go’s Interest Rates? 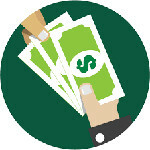 There is a fixed finance charge for cash advance or a payday loan you apply for. The charge does not depend on the length of the term. Fees, however, may differ from state to state. 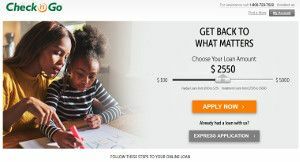 If you reside in Utah, for example, and apply for a $500 payday loan, the charge will make $125 regardless of the fact whether you repay the loan within a period of six or thirty-two days. A borrower can qualify for a loan ranging from $100 to $600 depending on the state you reside in. If you apply in Illinois, for instance, you can get higher loan amounts – up to $865. Installment loans of larger amount are also on offer. Which States Does Check ‘n Go Operate In? You can get you cash in such states as Alabama, California, Florida, Hawaii, Illinois, Indiana, Kansas, Maine, Michigan, Mississippi, Missouri, Nevada, North Dakota, Ohio, Oklahoma, South Dakota, Texas, and Utah. Other financial products are provided in additional states. What Is Check ‘n Go Loan Application Process Like? In order to qualify for a Check n’ Go online payday loan you have to meet the following requirements: to have a valid checking account, a proof of a steady income, to provide a valid email address and telephone number. The data you have to provide while filling out an application form includes your full name and address, Social Security number, date of birth, your employment details. Apart from that, you are required to provide your banking details, e.g. routing number and bank account number. The interest rates? They do not differ from those offered by other payday lending institutions. In some states, however, you may be required to provide a wider list of documents either online or by fax. It may be either your recent pay stub or a statement from your bank, or your ID card. What Are the Advantages of Check 'n Go in Comparison with Other Lenders? Being a direct lender, Check ‘n Go does not send any client information to partner-lenders. The process of application is simple and easy, the policy of charging fees is transparent, your cash is transferred into your account in a very short span of time.